The pump is probably the component most subject to wear in a hydraulic system, and the one most likely to cause a sudden or gradual failure in the system. Pump trouble is usually characterized by increased noise, increased heat, erratic operation of cylinders, difficulty or inability to develop full output, decreased speed of cylinders or hydraulic motors, or failure of the system to work at all. Hydraulic pumps are used in almost every type of production system, from plastic mold injection machines to the common conveyor belt. 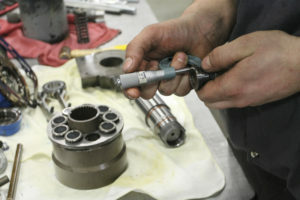 With proper maintenance, most hydraulic pumps will operate smoothly for years, but eventually, the pressure inside these devices will cause failures that need to be addressed as soon as possible. Below are a few signs you should have your pump taken to a machine shop for repairs. If your system is suffering from any of these symptoms, then that could be a clear sign that you need to repair, clean, or replace parts of your system. Never let your system run if it’s suffering from any of these problems – they are a real indicator that something is wrong and could result in serious damage to your hydraulics. Hydraulic pumps are designed to work quietly, but as parts wear down and seals deteriorate, you may begin to notice unusual noises. Banging and knocking sounds usually indicate air in the system or cavitation caused by insufficient pressure, which can have serious consequences if not corrected immediately. In many cases, these problems can be eliminated by identifying the point at which air is entering the system and taking steps to correct it. Many hydraulic leaks occur inside the machine, with no exterior signs of a malfunction. However, you may notice decreased performance, sudden drops in pressure, or oil on the outside of the pump in the case of exterior leaks. In many cases, tightening or replacing a valve or seal may correct the problem before it leads to system-wide failure. If your seals continuously leak and fail, your pump may be operating with a bent or misaligned rod. Depending on the extent of the damage, a skilled machine shop may be able to repair your existing equipment, allowing you to get the most out of your equipment and minimizing costs. Contact us for all of your Hydraulic Pump Repair needs!